Small Enhydro Quartz specimens, around 30-50MM long. 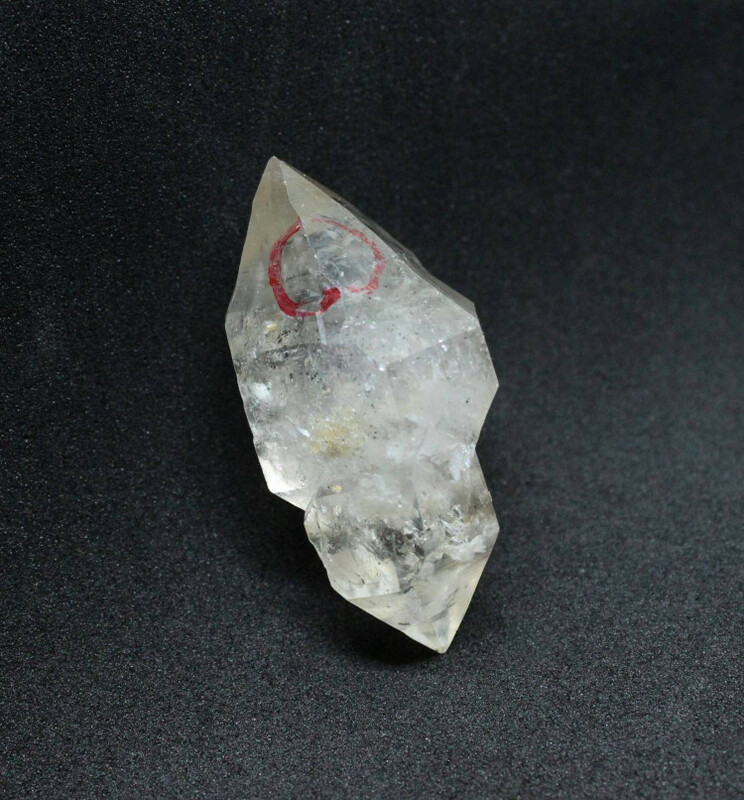 Rare enhydro Quartz specimens measuring between 30 and 60MM long approximately. What is an enhydro? An enhydro inclusion is a small cavity filled with water or other liquid inside a stone or crystal piece. It may have a bubble or two, or some other material inside. In these pieces, the enhydro inclusions are quite small, and only have a small amount of movement. Don’t imagine a large bubble moving around, unfortunately. They have had a line in permanent marker drawn around them to help you find the inclusion. Once you’ve located the enhydro you can remove this line with any solvent – nail polisher remover, strong alcohol, etc. The best way to view these inclusions is to place the crystal directly in front of a bright light source and move it around very slowly. While these pieces are relatively clear, they can also be quite included – cloudy too. They are also sometimes dual terminated crystals. Currently we have two pieces for sale, sold as 1 and 2 in our images. #1: 33 grams, 30x21x50MM approximately. This piece doesn’t actually have a bubble at all, but a small black piece, measuring around 1MM across trapped inside the enhydro inclusion. Because of the small black inclusion, it is quite easy to see. There is also a nice crystal shape in this dual terminated piece. #2: 24 grams, 23x20x50MM approximately. A little trickier to see, and not as nice a crystal – this piece has a bubble around 1MM across, with a travel of 4-5MM approximately. For more information about Quartz and a full list of all of our related products, please see our main ‘Quartz’ section.